Shifting correspondences… What matters love if self-love is absent? Likewise trust, fidelity, allegiance, faith. Everything that builds meaning and structure in personal reality begins within, from thence projected, informed, materialized. True trust is trust of self, inner allegiance to your higher self. If any of the pieces of what you wish to see in your world are not falling into the places your heart has set for them to be, it may be that a deficit within is preventing the free flow of productive, perfective creativity. Visualize all you want, but the light that you wish to cast into form will whither in your hands without the inner impetus to give it life. What you seek to create, you must already possess. It’s time to discover some secrets you’ve been keeping from yourself. A deep dive will lead to new energetic associations, on all levels of experience. Do you dare? Every experience that you encounter offers a chance for your creative potential to express some truth your soul has tucked within your being, to carry into the world of form. Of all the driving forces that propel an individual’s motivation to do, to create, none is more primal than the impulse to love. Not only to actively love another being—perhaps the highest consummation of what lay nascent within the human heart at the moment of becoming—but to love life in all its aspects. If that love is unable to come together in a desired outcome, relationship, family or social balance, fulfillment, et cetera, the need arises to examine the comprehension of what love means, within the inner understanding, the core experience. Thus it is that the striving to love always leads back to the search for inner balance, inner fulfillment, and ultimately trust in the divine order that put the spark that seeks its source. While you may pray and make prostrations to some harbinger of divine order to bring you these things, these situations that grant you inner peace (so you think), you’re well off the mark if you believe any power outside of yourself will bring you closer to love and all that it promises than you, yourself, can. How devoted are you to your whole-body well-being? How much do you trust the pattern of nature to bring you to an experience of an incarnation of divinity’s own living light? One more question: How much of an inner allegiance do you have to the actual truth of your own sacred self? Without that, you remain lost. Reality is swiftly shifting. All bets are off. The way is clear for you to find the source of that light that lives within you. Authenticity awaits. 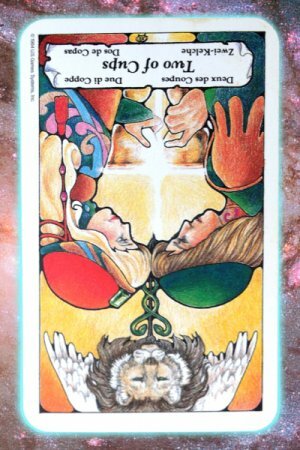 This post focuses awareness on the three-card spread of this week’s Pleiadian Tarot message. Get a deeper understanding of the movement of Nine through your reality. Nine’s Path Pleiadian Tarot messages are posted every Thursday, with a follow-up single-card reading for keeping on the path posted the following Monday. Subscribe to get them delivered to your inbox. Join a discussion of Pleiadian tarot posts at the Transients.info Roundtable Forum.